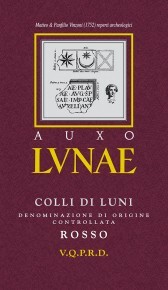 This great value, entry level red wine from Lunae is a Sangiovese-based blend which is typical of the Colli di Luni red wines, due to its proximity to Tuscany (70% Sangiovese, 15% Cannaiolo and 15% Ciliegiolo). Colli di Luni is in fact one of the few DOC appellations that straddles over two regions: the easternmost part Liguria (La Spezia) and neighboring coastal Tuscany (Massa Carrara). Everything about the Colli di Luni represents the transition between Liguria and Tuscany – the geography, the grape varieties, the wine styles. The key red-wine grape here is Tuscany’s principal red-wine grape Sangiovese, which forms the base (at least 50%) of any Colli di Luni rosso. A number of local varieties add their own unique twist to these blend, notably Canaiolo, Pollera Nera and Ciliegiolo. Sangiovese from this milder climate is usually more fruity than Sangiovese grown in Tuscany. ‘Auxo’ is a Greek word meaning ‘to grow, to develop’, a verb that moves nature and drives the wine-makers passion. Deep ruby red in color (given by the Cannaiolo and Ciliegiolo grapes), with an intense bouquet typical of Marasca cherry and red berries. Light and balanced, with a fresh and pleasantly astringent finish. It pairs beautifully with rich pasta dishes and red meat, stewed or grilled. Hand harvested. 10 days on the skins followed by 10 months in large oak barrels.